My Card Attic: The Minute You Have All Been Waiting For! Hi, my lovelies! I hinted in my last post that something exciting was happening and you said you couldn't wait to know what it was! Well, as you will have already seen, when you came in, its my . . . new look blog! My dear, sweet, friend Loll Thompson (of course you will all know Loll) generously offered to help me give my blog a whole new fresh look! Of course, I jumped at the chance! I love creating things, but I am no good at the 'nuts and bolts' of it all. All my input here was the choices of colours, fonts, etc., and I did the header and signature, but Loll, bless her heart did everything else for me, including my nice new watermark! To say I'm over the moon is an understatement! So I made this card with Loll in mind ready for the launch! 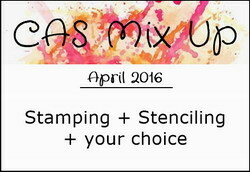 As it has stencilling and stamping, plus a die-cut, it was only fitting that I also enter it into Loll & Bonnie's CAS Mix Up Challenge which calls for those things. So, without further ado, here is the card . . . this one is for you Loll . . . thank you so very much!! I sponged Encore Silver Ink through a stencil in two corners, splattered it with some silver paint, wound some silver thread around and adhered it with the die-cut. Then I stamped the rest of the sentiment in silver ink and added two strips of card-stock on the left hand margin to tie everything in. So, what do you think . . . I LOVE it!! Hello Hazel, I love your beautiful card and I LOVE your new blog too! It looks very fresh and contemporary, suiting really well the style of the cards you make. OOH Hazel, snazzy new blog! You are pinterest ready and have your own watermark...looks FAB! I love the silver and black card you made! 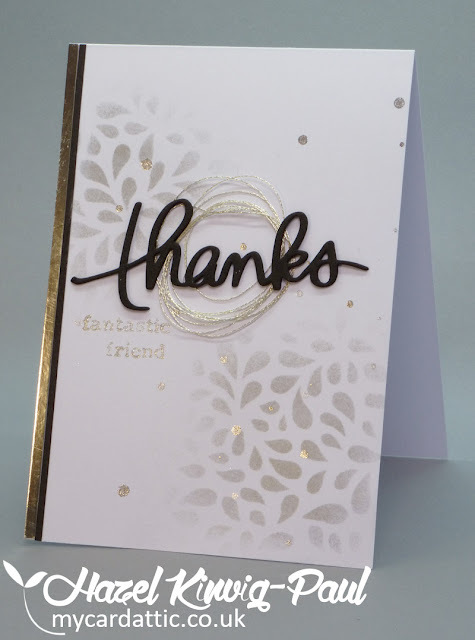 This is so lovely and it is hard to use metallic and you have done it so well! Awww ... thanks for the beautiful card Hazel. I LOVE it! Gorgeous mix of elements that work so perfectly together. Thanks so much for sharing with us at CAS Mix Up! isn't Loll just the most generous with her time and help - she helped me with my new header too and also the pin it butterfly - and what a beautiful card you made for her! Completely loving the new look..the heaer a oks so artsy..watercolor trend !! You card has turned out so Elegant ! Your blog design looks terrific! Wow! 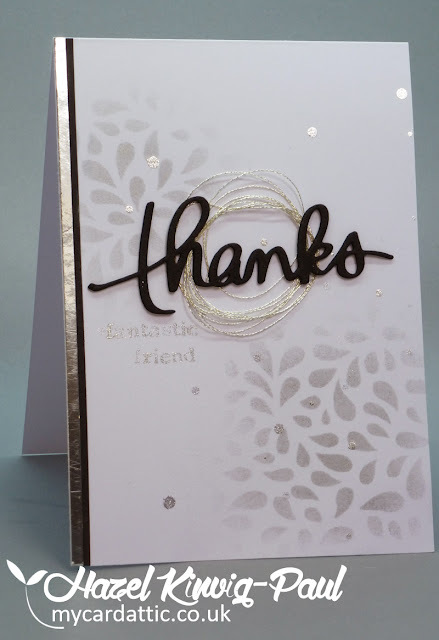 Your card is so pretty, especially the stenciling! Sorry for not commenting lately. We have been away on a little trip and I am trying to catch up. Because of that I will just say here that I looked at all your cards and they are fabulous as usual! Absolutely love this one and it's perfect for Loll! Your blog looks fantastic and very professional with the new header, signature, watermark, etc.! Love it! 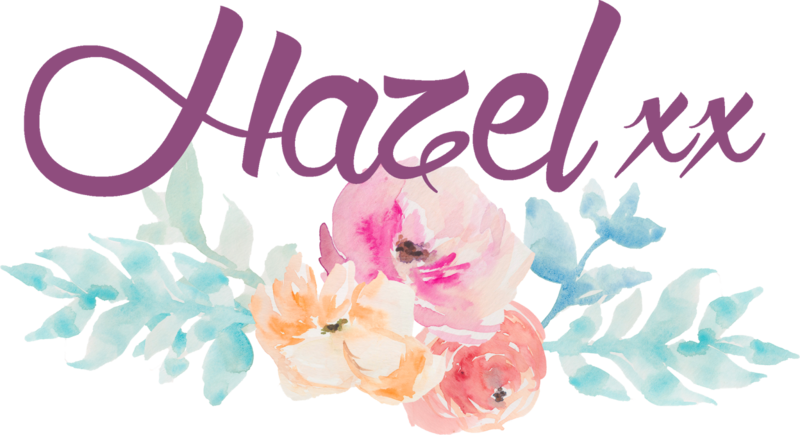 Oh, my, Hazel - I LOOOOOOVE the new look of your blog, my friend!!! The flowers at the top are so pretty and the whole lo is very neat!!!! 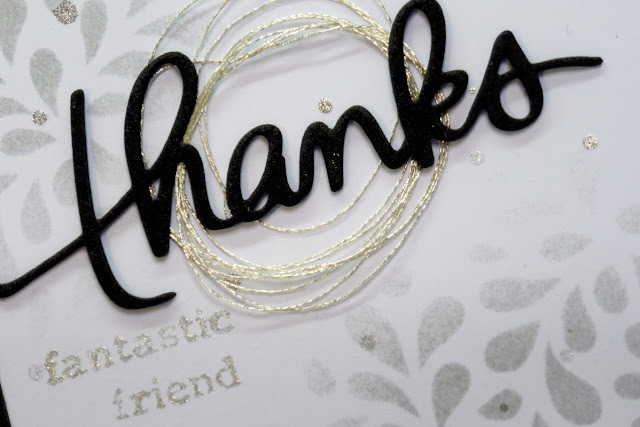 Loll has done a fantastic job and with your input the two of you have really done a great job!!!! Absolutely wonderful and very professional looking!!! And your card for Loll is GORGEOUS, Hazel!!!! The stencilling is so beautiful and I love the ink splatters and the silver and black strips at the left!!! The thread is lovely, too!!!! Such a great card, my friend!!!! This unique card! Beautiful and elegant. I love the subdued colors, gently diffuse stenciling and silver accessories. I can not take my eyes off this wonderful card. Hazel your new bloglift is fabulous--those always feel so good. Love the card you created with Loll is mind, the stenciling is so subtle in the background and yet so striking! Love, love, love your new blog look and watermark, Hazel! Loll is a whiz and such a blessing to us! 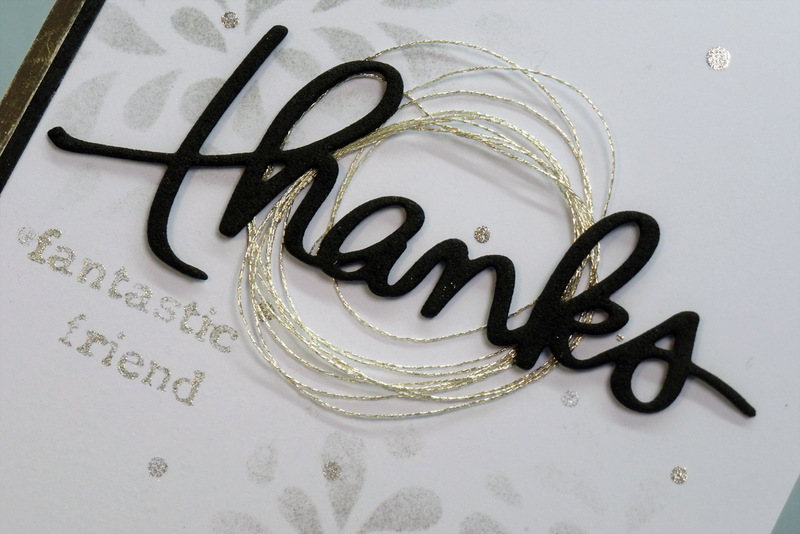 Your card is pure understated elegance! Beautiful! Thanks for sharing it with us at CAS Mix Up! gorgeous...both your blog and your card! I love your new look, too! And your card is beautiful! What a fun way to start the summer season - it's like having spring cleaning all done and new slipcovers put on the furniture! Congratulations! Hazel, your blog looks beautiful! Your watermark is wonderful too! Congratulations on your updated look. Your card is gorgeous, I love all of the shimmery silver!